Time for a new update, now we've reached 200 followers on the Facebook and Twitter feeds. It’s been just over a month since the last one, when I announced we’d reached our ambitious fundraising goal of $8,500, in order to complete the filming in the United States and Canada. I still can’t thank the people who contributed to the campaign enough. Indebted is putting it mildly. Already, international flights have been booked, in order to rendezvous with lighting cameraman, Eric Shepherd, in Toronto NEXT MARCH. We’ll begin there, before moving on to Vancouver. Then it’s back to America in LA, San Diego, Colorado, before concluding (with any luck) in Mississippi. Logistics are underway to arrange for the key cast & crew remaining, to be available for interviews within a 4-week timeframe. Here in England, post production is moving along comfortably. I’m currently sorting through budgets and quotations for what will be an extensive process, but one I’m looking forward to next Summer. But, as far as the documentary, that’s about it. That however isn’t enough for the first post in a month, so in memory of the recently-departed Ernest Borgnine, who sadly passed away in July, here is a series of tributes from 7 crew members, covering a wide spectrum of the production departments on "AIRWOLF". I’d like to add that Ernie (as it seems he was fondly called and referred to) is someone whom I will always be incredibly disappointed that I didn‘t meet, nor interview for the project. Unfortunately, at the time when preparations were in motion for the first shoot last year, certain circumstances prevented us from securing him for what would have been a very specific, memory-challenging interview; one that I’m sure he would of relished, having seen several with him, and learning about his strong, admired-by-many work ethic. For myself, and I’m sure Eric as well, it was meant to be, rather than not, since the show has been the single most favourite television series of mine since I was 7 years old (I‘m now 24), and one of his as well. To not of had that golden opportunity, to not of met the legend of a man who portrayed the lovable, irreplaceable Dominic Santini (much like Ernie himself, and to quote Don Bellisario, the creator of "AIRWOLF" from his own interview: "Santini IS Ernie Borgnine"), I will whole humbly be saddened and frustrated for a long time that it didn’t materialise; not help but think what it would of been like, and the material we could of got. I hope at the very least though, that the 60 plus cast & crew we will have interviewed by the end of the 2nd, final shoot next April, will have made up for that colossal absence. On behalf of the "AIRWOLF" documentary team, this post is dedicated in memory of Dominic Santini...and Ernie. Ernie was something special. He was never without a smile, a nice thing to say, and a feeling that you were important to him, when actually he was much more important to us. Everyone who knew him was privileged to be touched by him. Over the years since "AIRWOLF", I’ve ran into Ernie from time to time in stores like Costco, the Home Depot (never in Beverly Hills) and it was always the same. A big smile. A friendly hug. A pleasant few moments. I will miss that…I will miss him. I first met Ernie at the character boat parade in Newport Bay. The PT boat from the TV show “McHale’s Navy”, was entered by my dad who was Vice President at Universal Television. Years later, I directed Ernie in an episode of "AIRWOLF". What a wonderful man and a wonderful actor. Ernie was a very nice guy and I enjoyed working with him on sets. He was always courteous and very professional. I remember one day when I was preparing for a shot at Jetcopters [at Van Nuys Airport] that Ernie, personally, gave me a tour of his pride and joy motor-home, which I greatly appreciated. I've enjoyed the shows that he's been in, "From Here to Eternity" to "AIRWOLF". I was sad to hear of his passing, but happy to know that he lived to 95 years and he enjoyed his work. As the Key Second AD on the 3rd Season of the show, I always enjoyed calling Ernie's home to give him his call time and scene numbers for the next day's work. Some times, Tova [his wife] would answer the phone, and was always cordial and friendly. He always answered the phone in a delightful way, full of energy and vigour. We would have a small exchange, and he always said good night before he hung up the phone. I treated it as a special moment between he and I. "AIRWOLF" was a very difficult show to work on. But for me, the one bright spot was Ernie. One day, we stopped each other on the street, and he said something to me (which I won't repeat) that eased my burden. After I retired, I was staying with my kids in Junction City, Oregon, which happened to be next door to a very good restaurant. At some point, I heard that Ernie was eating next door. I went over and talked with him. It was, as always, a delightful conversation. When I heard about his death, I was saddened. He was a great guy. Too bad the world has so few like him. 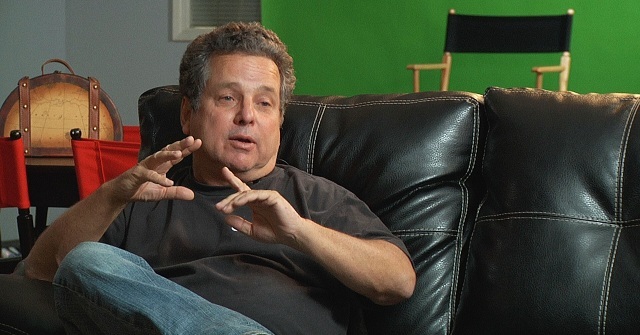 My name is Rick Shuster and I met Ernie on the "AIRWOLF" show. I will always remember him from our first encounter. I was a new pilot working on the show, and I was asked to shut down the Santini Air helicopter after a shot. As I approached the helicopter, Ernie walked over to me and said: “You might want to put on a jacket as it is pretty cold up there". I told him I was just shutting down the helicopter, and thanked him just the same. At the time I was star struck, and couldn't believe that this larger than life star would take the time to tell me I might want to wear a jacket if I was going to fly. Fast forward many years later, I had worked on many films and TV shows. Working around famous people was nothing new, and I didn't think I could be surprised. 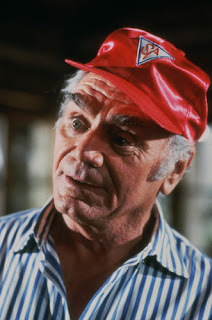 So, when I ran into Ernest Borgnine on the “McHale’s Navy” movie in Mexico, on a remote island, I remembered my first encounter with this incredibly nice man, and wanted to tell him that he was one of the nicest actors I had ever met. Well, he surprised me again. I hadn't had the opportunity to talk to him yet, when a local young island boy walked up to him and asked to have his picture taken with him in front of the helicopter. His reply was: “I thought you'd never ask", and got up from his air conditioned spot in 105 degree heat, walked over to the helicopter, and took a picture with the young local and myself. I still have that picture on my wall today. When I get asked who I enjoyed working with and who is the nicest actor, Ernest Borgnine is at the top of my list. 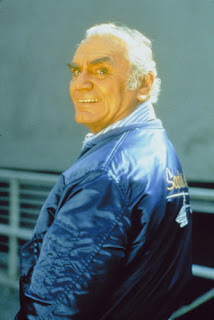 We thank the casting director in the sky for Ernest Borgnine. The first time I met Ernest Borgnine (Ernie) was in a pub; The Greyhound Inn at Aldbury, in Hertfordshire, England. It was in 1967 during a lunch break from filming “The Dirty Dozen“. A fun lunch at the bar with Ernie, who played General Worden in the movie. John Cassavetes, Richard Jaeckel, Donald Sutherland, myself and others, relaxed and told stories & jokes. I was one of the stuntmen on Gerry Crampton’s stunt team for the film. Ernest Borgnine, a star of the first order, was respected and admired by all on the production. Never late, always had his lines down to a tee, and ready to help anyone. I think I may have had words with him once or twice during the production (like ‘good morning‘) and so on, and that was about it. But, believe it or not, he remembered me. I went on to become a writer and director, and in the Seventies, returned to Hollywood to direct many television shows. One being "AIRWOLF" in 1984. And who was my star? Ernest Borgnine. He remembered me from ‘67. A few days later, Wendy, my wife, invited him and his super wife Tova, to a dinner party at our house. A dinner with Robert Wagner, Sheldon Leonard and Ernest Borgnine. A night to remember! Great stories back and forth. I have directed and worked with hundreds of actors, and Ernie was among the tops. He would bend over backwards to help another actor that was having a bad time with a scene. I remember on one occasion [during filming of the 'Inn at the End of the Road' episode], an actress kept blowing her lines half way through the scene. I cut four times for her. She was getting into a state, and making it worse for herself. Ernie looked at his watch out of the corner of his eye, then looked at me and winked. It was five minutes from the days end of shooting. I knew what Ernie was going to do. He had done it before when I had directed. I said action. The second speech in was Ernie’s. He blew the line (on purpose) and apologized profusely to all. We broke for the day and went home. Next morning, I said action on the same scene, and the lovely young actress sailed through word perfect. That was Ernest Borgnine. A gentleman respected by all that knew him on and off the set. He was a man considerate of others. I loved to direct Ernie. I joke there was very little directing to do with him. He was a master at his craft and it showed. God bless you Ernie for being a very small part of my life, and rest well sir. In my next life I may come back as Ernest Borgnine, Robert Wagner, Roger Moore, or Tom Selleck. Four super actors, and wonderful to work with. Just imagine having all four on the same set as a director. A directors dream. Woke up the morning to find another $500 had been donated, and a 5th Associate Producer as a result. That now takes us past our target goal of $8,500! It's finally over. I'd like to sincerely thank every single person who contributed, and everyone who shared, retweeted, tweeted, e-mailed and called to send the word out about the campaign throughout the 7 weeks it ran for. I'm absolutely amazed and thrilled, and can't wait to get back to the States, in addition to Canada, to complete the filming of this mammoth & ambitious production. For those of you who still wish to contribute, the campaign closes this Friday night at 11:59 PM,Pacific Time. That's West Coast / California, so to give a comparison for other parts of the world, London is 8 hours ahead. To the people who contributed, we’ll keep you up-to-date about when you'll receive your perks. As you know, Mark J. Cairns, my co-producer, is still busy with the upcoming "Airwolf Extended Themes" sequel album. He's update on release is "coming soon", but the other "Airwolf Themes" gifts of $10, $25 and $50, will be prepared and dispatched by the end of this month (September). For the higher-level rewards of $250, $500 and $1000, those will of course be delivered when the documentary is ready for distribution. And on that note, keep on eye on here for some major news concerning the release date. You may be seeing it A YEAR EARLIER than planned. Once again, my sincerest thanks and gratitude to the 61 contributors (or shall I say, investors! ), and please look forward to what will be one of the most unprecedented, extensive and in-depth retrospectives that has been produced on a television series or film. Tonight, we have a special update for you. An exclusive, 5-minute PROMO, showcasing the cast & crew of "AIRWOLF", discussing the unforgettable theme music and episodic scores by the show's leading composer, Sylvester Levay. With sincere thanks to co-producer Mark J. Cairns for cutting this, and producing the "azimuth" motion graphics based on those designed for the series, it's a fantastic preview I hope you'll enjoy. It's also to push forward the IMMINENT deadline for the fundraising campaign. There is only 11 DAYS LEFT. It ends NEXT Friday, 14th September. If you haven't already made a contribution, and have been planning to do so (as I'm aware from three long-serving fans they are), I would hugely appreciate it if you could submit as soon as possible, so we have a better idea of how much we'll be left to raise in the final week. I don't mean to push at all, as we've done well so far, but there's just under $3,500 remaining to gather, and time's catching up on us. Fighting Like a Hawke - just over 2 WEEKS LEFT on fundraise! With only 17 DAYS LEFTon the fundraise, we still have $3,530 remaining to gather, in order to complete all filming next year with a second and final shoot. As we've had a massive surge of followers and traffic over the last few days there, I'd like to sincerely ask each and every one of you to consider making even the smallest contribution. A low-cost $10 perk was introduced over a week ago, and there's still many other rewards to be had, ranging from $25 to $1,000. Please help us in reaching our goal, to finally complete photography of this special & unprecedented project. It's a 'One Way Express' to target: FUNDRAISE CAMPAIGN LAUNCHED! Apologies again for not posting sooner, but I've been in the midst of various priorities on the project. The first is that I launched a special fundraising campaign on Indie Gogo just over 2 weeks ago, in order for us to complete all filming on a 2nd and final shoot across Canada and America. I'm thrilled to announce that we've now raised OVER HALF OUR TARGET BUDGET of $8,500, and I've been thoroughly impressed by people's efforts to bring us this far in a short period of time. We now have 3 Associate Producers (one of them only today), and 2 Executive Producers as a result, so I'd like to formally welcome them aboard. But I still need YOUR HELP. We need to keep the momentum going, in order to reach that target. And there are only 33 DAYS REMAINING. After receiving a generous contribution earlier the evening, we now stand at $4,525. There are several perks and rewards to be had, including YOUR CHANCE to become an ASSOCIATE or EXECUTIVE PRODUCER. If you'd rather not become one, you can be credited under "Special Thanks", or contribute in return for exclusive "Airwolf Themes" prizes. Amongst the perks are unique "Supporter's Edition" copies of the final DVD, which nobody else will be able to purchase, and we've been able to offer a number of outstanding incentives, with a select group of cast & crew, including writer/producer Burton Armus, concept designer/illustrator Andrew Probert, "Marella" herself, Deborah Pratt, and the legendary father-and-son pilot team, Peter McKernan, SNR & JR.
SNR was the owner of Jetcopters, the supplier of all aircraft featured on the show, and JR became Aerial Coordinator in the 3rd Season, after the incomparable David Jones' departure. 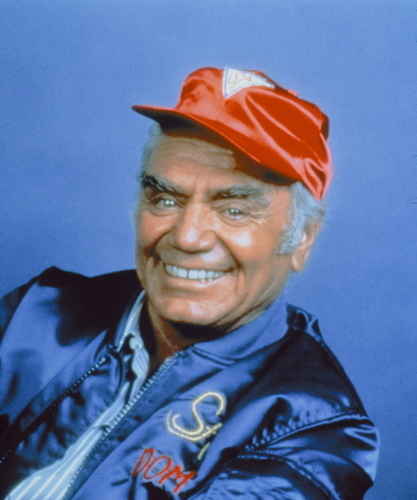 To extend on Burt and co, Burt handled the scripts for the classic 1st Season, including the penning of 'Daddy's Gone a Hunt'n', 'One Way Express' & 'Fight Like a Dove'. Andrew designed the helicopter, cockpit, flight-suits & helmets, logo and the "Wolf in Sheep's Clothing" insignia. Finally, Deborah made her screenwriting debut with the outstanding 2nd Season episode, 'Fallen Angel', before becoming Head Writer and Co-Exec. Producer on Don Bellisario's science-fiction series, "Quantum Leap". I'm aware in a previous post that I stated the initial target for the campaign was $7k, but we require a little more than 3 weeks for shooting, and Indie Gogo deduct platform fees from the final amount raised. I've also chosen flexible funding, rather than fixed. The difference is, if we don't reach the target, whatever money has been raised (minus 9% to Indie) is retained. If it were fixed, and we don't reach the target, all money will of been refunded, after all that work, effort and time. The target budget of $8,500 will afford myself and our USA lighting cameraman, Eric Shepherd, time to travel to TORONTO and VANCOUVER to cover Season 4, and I already have 16 cast & crew from that production secured for interviews. Following that, it will enable us to travel back to CALIFORNIA, to meet the stunt, camera, grip, sound editing, costume, visual and miniature effects departments; culminating in a SPECIAL REUNION with them and the 40+ cast & crew interviewed last year. Onto the second update. I launched a dedicated Twitter account not long after the campaign went live. Previously, the one that was linked to the button on the right menu of this page was my personal feed. It is now connected to a stand-alone one, to promote the documentary on the social media network. Sections 2 and 3 are already a considerable length. 2 will be sub-divided into five segments, and 3 into eleven, so no one will have reason to complain about too short a running time! Speaking of those 42 interviews, one of those was shot recently, following my previous blog post in late May. I came into contact with 2nd/3rd Season composer, Udi Harpaz, and as it occured, he was scheduled to be in London on business within two weeks of enquiring. It was a hectic rush, but the interview was secured and filmed last month. Unfortunately, I don't have a screenshot to post from the shoot, since it was shot by a different cameraman on a different setup, but in time, there'll be one, along with Ray Austin, who I'm aware I promised to have one from his interview online. Again, that was also recorded on a camera which isn't particularly friendly when it comes to playback (because of insane file sizes and video formats). But that's where we stand at the moment. Again, I sincerely need and would appreciate ANY and ALL HELP with the campaign, whether it's making a contribution between $10 and $1000, or spreading the word to everyone you know. You never know just who will come forward to make a donation. It will go a long way, and I'll be indebted to you for your support. As I state on the campaign page, let's make this the most unprecedented, unrivalled and in-depth retrospective documentary on any television series produced. The producer of the forthcoming "AIRWOLF EXTENDED THEMES" album, Mark J. Cairns, and his orchestrator/associate producer, Jan Michal Szulew, continue to work solid on the anticipated sequel soundtrack to "AIRWOLF THEMES". Check-in with their individual blogs for updates and preview teasers of the all-new tracks. Brief update. The initial stages of the editing have taken longer than anticipated. But already, a clear, categorised structure has taken shape. The 34 interviews shot so far have dictated this, and I've only realised just how much material we have. Out of the adjectives Microsoft Word's thesaurus offers, I think the word 'gargantuan' would adequately describe the amount of film there is. Ambitious? Just a bit. Onto other matters. 7 cast and crew members from the show, all of high-value, are onboard for the upcoming KickStarter fundraise. They're supporting it in full, and I can't be happier with that. I'm sure you'll get a kick out of what they're offering when we launch, along with Co-Producer Mark J. Cairns' range of acclaimed products based on the series. The final arrangements for the project page at the crowd-funding site are coming together, so we hope to have them in order soon. Until then, meet this man below. Responsible for many of the incredible, spectacular shots of "AIRWOLF" in-flight, including his signature POV shots racing across terrain and water, his contribution to the show was nothing short of priceless. Together with 2nd Unit Director and Aerial Coordinator, David Jones, the footage photographed by McClain lent the show it's ground-breaking look in filming airborne action. The producer of the forthcoming "AIRWOLF EXTENDED THEMES" album, Mark J. Cairns, and his orchestrator/associate producer, Jan Michal Szulew, are still working flat-out on the highly-anticipated sequel soundtrack, to the best-selling "AIRWOLF THEMES". Check-in with their individual blogs for updates and preview teasers from the all-new tracks, by clicking on their names. "Hey, Dom! What's holdin' you up?" Sincere apologies for not posting on here for over 3 months. I've had some of the fans from the online forums enquiring what the progress is with the project. I must make a clear and polite point first though regarding that matter. This documentary is being worked STRICTLY on an AS-AND-WHEN BASIS. Myself, Eric Shepherd (camera & sound) and Nick Light (our appointed editor; please see below regarding post-production) all have our own seperate & on-going professional commitments. "AIRWOLF" unfortunately isn't the only production we're working on, so I hope everyone can understand that and appreciate it. Archangel's line in Season 2's 'Sins of the Past, during his heated confrontation with Hawke over Dominic's framed-for-murder arrest, just about sums it up: "Don't jump all over me, I'm asking you to GIVE ME SOME TIME!". But please, try not to take that to heart. Perhaps Hawke's one-liner in the equally dramatic 1st Season episode, 'Mad Over Miami', would be more apt: "I simply trade for trust." Onto to the production update. On my return back to the UK last November, following the principal 5-week shoot Stateside, I was pleased to secure local Newcastle and London editor Nick Light, to fulfil the demanding role for what is still a growing and evolving documentary. You may have noticed that I've updated the blog description below the custom logo above, with the indication of not 50, but now 60 cast & crew interviews. This is because I have decided to schedule and make arrangements to gather finance for a 2nd shoot back in the USA, but this leg will also include time in Toronto and Vancouver in Canada, to interview the cast & crew of the notorious 4th Season of the series. The so-called "sequel" year, entitled "AIRWOLF II" in production, has undoubtedly divided fans across the world since its debut on the USA Network in 1987, not at least for its severe budget cuts, the original cast being written out in favour for an all-new group of actors, led by "Battlestar Galactica: 1980" star, Barry Van Dyke, but the absence of the real, flying Bell 222 modifed helicopter as well. As a result, extensive use was made out of access to multiple reels of un-used aerial stock footage, which were incredibly left over from the CBS seasons. Many of the shots not included by the Universal editors were phenomenal, and it ponders the question why they weren't utilised, considering their exceptional photography and action. But anyway, back to the subject in hand. I've already secured a number of the Canadian team, both performers and technicians, and that number is still rising. I hope you'll agree with me that, despite it's flaws and constraints, the 4th Season is still a significant and intriguing part of the "AIRWOLF" canon, no matter what your opinion of it is. I for one have always enjoyed it thoroughly on it's *own merits*. I've honestly believed that the fans would of taken to it far more warmly, if it of had the same million-dollar production budgets and resources as the American show, regardless of "killing off" the original cast. After having brief discussions with some of it's directors who helmed the Vancouver-shot episodes, they certainly deserve their stories, memories and recollections to be heard, for at the very least to be appreciated a great deal more. Alongside those Northern "AIRWOLF" film-makers, several other cast and crew from the original 3 seasons, who we didn't have time to interview last year, because of the gapless schedule and already-high number of people to cover, have also been lined up. We intend to reach Los Angeles, once all Canuck filming has been completed. But there is a but, and I do need your help to make it happen. I had hoped to present all the confirmed aspects of the plan I have in mind to you in this post, but since some of the original CBS production team are still considering their involvement in it, and again, its been quite sometime since my last post on this blog, I'll instead for now explain it briefly. Within the next month, we'll be launching a large, fund-raising campaign on the popular online crowd-funding platform, Kick Starter (http://www.kickstarter.com). Many productions and film-related projects, including ambitious, feature-length documentaries, have been successfully financed as a result of Kick Starter efforts. It is hoped that "AIRWOLF: ECHOES FROM THE FIRM" will be one to add to the list. As the entire 5-week shoot last Autumn (Fall) was self-financed by myself (and it was a fortune! ), I therefore cannot provide the money required to return to the United States and Canada, and fully complete the filming of the interviews required to make this documentary the most in-depth, comprehensive and *completist* retrospective on ANY past television series. In addition to those, we have a number of excellent gifts and materials in exchange of specific amounts, including special one-off editions of Mark J. Cairns' internationally best-selling and critically-acclaimed "Airwolf Themes" soundtrack. Similarly exclusive copies of his forthcoming sequel soundtrack, "Airwolf Extended Themes", in collaboration with Polish musician Jan Michal Szulew, will also be on the table. Until we hear back from the remaining cast & crew members who we hope will support this campaign, to enhance and extend the project to an even bigger scale, the campaign won't be going live for now. In the meantime, myself and Nick (the editor) will be working on the 1st 'story edit' of the entire programme. This entails assembing of the 40 plus hours of footage already shot, including one that I made an genuine oversight of, when posting screenshots and names of interviewees in America last year. The unrevealed person was Ray Austin, who directed the classic 2nd Season installments of 'Firestorm' and 'Inn at the End of the Road'. This was the only interview that took place here in the UK. An image from his conversation will be released in the next post. For now, I hope that you can all continue to support "AIRWOLF: ECHOES FROM THE FIRM", and perhaps you can have a good, careful think about becoming an integral part of it's production, when we launch the fund-raising campaign. We would certainly be indebted to you if you did, and the rewards to be gained from such a collaboration will be priceless. The producer of the forthcoming "AIRWOLF EXTENDED THEMES" album, Mark J. Cairns, and his orchestrator/associate producer, Jan Michal Szulew, have been working flat-out on the highly-anticipated sequel soundtrack, to the original best-selling "AIRWOLF THEMES". Check-in with their individual blogs for updates and preview teasers from the all-new tracks, by clicking on their names above. An 80's kid trapped in the 21st century. A ginger Geordie.